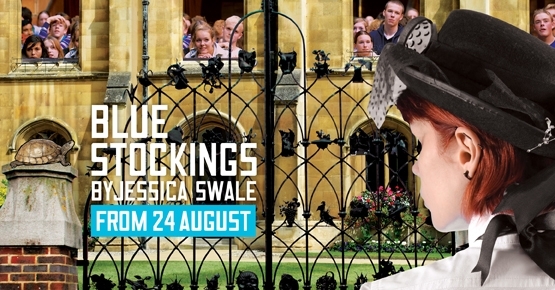 Blue Stockings at the Globe focusses on the fight of a small but determined group of female Cambridge students, fighting for the right to graduate. In a break with the worryingly common response to Blue Stockings – disbelief that women could be treated so appallingly – I was genuinely surprised at quite how surprised even some well-educated people were at the position of women in the nineteenth century. I realise as a History graduate I’ve probably had access to a wider range of periods and topics than the standard Tudors, Victorians and World Wars that seem perennially prescribed by the National Curriculum. Yet I was still taken aback that people found the depictions in the play such a revelation. Jessica Swale’s play at the Globe is therefore hugely important in raising awareness of not just the plight of Cambridge students but of social inequality in general. While I’m glad that the general consensus is so vociferously against the misogynistic views of the nineteenth-century establishment, with audience boos, cheers and catcalling in the yard, the play should spark a serious debate about social inequality and its continued effects on our society. And from a historical standpoint, this means taking a step back from the initial outrage at these offensive views. It’s anachronistic to impose contemporary moral standards onto a past society. While it can seem particularly distasteful to hear vehement misogyny in such a relatively recent period, it is surely more useful – and fairer on those we are judging – to try and understand these views within the context of their time. The play is set in 1896 – Victorian society and law had very different ideas about morality and the structure of society. In 1831 a 14 year old boy was executed for murder, and in 1833 a nine year old was sentenced to death for housebreaking – although this was later reprieved under public pressure. Slavery was not abolished in Britain until 1833 and public executions continued until 1868. The position of women in general society puts the challenges women faced at Cambridge, serious as they are, into perspective. It was not until 1870 that women were allowed to be the legal owners of the money they earned and to inherit property. It was not until the Married Women’s Property Act of 1882 that wives possessed a legal identity; previously courts didn’t recognize a wife as a separate legal entity to her husband. The play briefly touches on the Women’s Suffrage movement, and the complex political implications of political involvement on those campaigning for smaller victories. It was a long fight, and women didn’t receive the vote until 1918. Even then this was only for those over the age of 30 who met minimum property qualifications – it was not until 1928 that women received equal voting rights to men. Yet perhaps more surprisingly, and often overlooked, until 1918 forty per cent of adult males were also disenfranchised. There was clearly a large element of self-interest in the barring of female students from graduating, as with the withholding of universal suffrage and the amalgamation of a wife’s legal identity with that of her husband. The views these men espouse can seem ridiculous to our modern sensibilities, and were certainly often received with laughter by the audience of Blue Stockings, but it’s important to remember that many men (and women) will have genuinely believed that the mental taxation of study could be not only mentally but also physically damaging to women. If you believe this, and that women’s collective vocation is to be mothers and wives, then you probably think that you’re doing them a favour by discouraging them from studying. And access to education has not always been seen as a right. Compulsory education was not introduced in Britain until 1880, and then only for children of five to ten years – and it was ineffectively enforced. The women with the education, talent and resources to make it to Cambridge were still privileged in comparison to the majority of the population. The general disparity in education continued well into the Twentieth Century, as the play’s final scene points out. Before the Second World War less than 2% of 18-year olds went to University. Oxford and Cambridge were still very much finishing schools for gentlemen. In 1939 women constituted less than a quarter of the university student population, a proportion which remained fairly stable until the late 1960s, when it began slowly to rise – real change did not begin until the 1970s. And it’s also important to point out that the play is set in Cambridge, traditionally a bastion of the British Establishment. Conditions were better elsewhere in the country: if the women in Blue Stockings had wished, they could have graduated from the University of London, which in 1878 became the first UK University to admit women to its degrees. In 1881 two women obtained a BSc, by 1895 over 10 per cent of the graduates were women and by 1900 the proportion had increased to 30 per cent. As is the case today, not all universities were the same, and the situation in Cambridge, and the views of its inhabitants, do not necessarily reflect the country as a whole. In any society there will always be thinkers ahead of their time and those clinging desperately to the past, and the social elite that populated Cambridge have always tended towards conservatism. Jessica Swale only alludes to some of the more violent protests against the bluestockings, which in real life included burning effigies of the female students. While the outright misogyny found in Blue Stockings is thankfully unacceptable in contemporary Britain, the example of Malala Yousafzai (to whom Blue Stockings is dedicated) serves as a reminder that for some the fight for a right to an education continues. Closer to home, with the introduction of £9000 tuition fees, it seems as if the economic educational divide will grow. And it’s not just financial restrictions that affect your experience of university. Laura Wade’s Posh may be set in Oxford, but it demonstrates the rigid social hierarchy that still supports the upper echelons of our society. The play’s popularity demonstrates that our interest in the educational elite is as strong as ever. And it seems that discrimination, of a subtler sort, is still hampering access to a Cambridge education – earlier this year it was reported that people applying to study medicine at Cambridge with three A*s at A-level are more than 20% more likely to be given an offer if they are white than if they are from an ethnic minority. On a personal note, studying History at University the majority of my peers were female. Looking at my tutors, the majority of teaching staff (and the vast majority of the older tutors) were men. It seems that in academia, as in so many areas of life, historical institutional sexism has left a noticeable legacy. And the pay gap between men and women persists, with female law graduates, for instance, earning 28% less than men at the start of their careers. Sitting in the audience at the Globe it is easy to feel smug, and to deride the ‘villains’ of Blue Stockings as antiquated relics of another era. But perhaps we should take a minute to look at our own society before we condemn theirs. Since its premiere at the Royal Court, Posh has been causing a stir. It’s highly entertaining, and also thought-provoking. I would describe the characters as caricatures, but they are perhaps all the more funny for the fact that people that extreme do exist (some of them are running the country). The performances are all excellent, and the boys are thoroughly convincing; they’ve perfected the demeanour and speech of the over-privileged, and ooze a sense of entitlement. The play highlights the challenges facing the upper class, as the National Trust take over their houses and they are forced into internships and Numerical Reasoning Tests. However, it also lists the long history of challenges, such as industrialisation, that the upper class has overcome and this reinforces the underlying sense of the entrenched and immovable power of the upper classes. The fact that Posh is part of an increasing fashion to poke fun at the privileged is acknowledged within the play itself. In the programme, Laura Barton talks about the increasing fascination with the upper class in recent years, citing examples such as Downton Abbey and Titanic – yet these programmes are all set in the past. As was the conclusion of Grayson Perry’s documentary on class, it seems that the upper class is intrinsically linked to their history. In the present, Made in Chelsea and Will and Kate have made posh ‘cool’, but this is posh as a fashion statement or a lifestyle rather than as a social and political reality. The posh occupy an aspirational lifestyle; this explains the nation’s fascination with Kate Middleton’s marriage into the monarchy. Yet Barton also recognises how much reassurance and satisfaction we gain from having an upper class to rail against. Not only do they provide a useful scapegoat for our troubles but in a world of upheaval it is comforting to recognise the continuity and timelessness of the upper classes. Whatever your view of the upper classes, the message of Posh is clear: they’re here to stay.